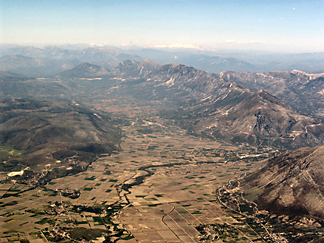 As GF poetically observed in Epitaph for a Squadron, the airfield lies in the vale of Decelia, below the massive limestone slopes of Mt Parnes to the West, with the Pentelikon rising to the East. Here Greek airmen first took flight in the 1930s, when the aerodrome known as Athens (Tatoi) was of some importance to international airlines. Today the airfield is occupied by the HAF as Dekelia-Tatoi Air Base, where the Athens Glider Club still retains flying rights. The airfield, TATOI LGTT, is at 38° 06' 32"N 23° 47' 02"E with an elevation of 785ft (239 metres) and the main runway, now as then, is aligned 0321, the winds of change notwithstanding. The airfield is some 10 miles or 16 km North of the centre of Athens. In the 1940s, Tatoi railway station was a mile or so to the East, on the line that still runs from Athens north to Thebes and on to Larisa and Thessaloniki. Perhaps 12 miles or 20 km to the West of the airfield is Elevsis (Eleusis), close by the bay of the same name and on the railway west to Corinth. 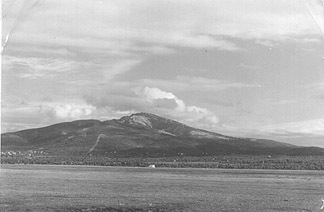 A fine shot across the empty grass landing area in 1940, looking East to the mass of the Pentelikon. Jim Fryatt held an identical print. In the middle distance, a dispersals tent. Beyond it, a line of telegraph poles evident in the original indicates a road and/or railway line. In the 1930s, maps of the area show both running to the immediate East of the aerodrome area, as do aerial photographs from 1944. Eastwards across the airfield, towards the slopes of the Pentelikon. A slightly different view, from my father’s album. 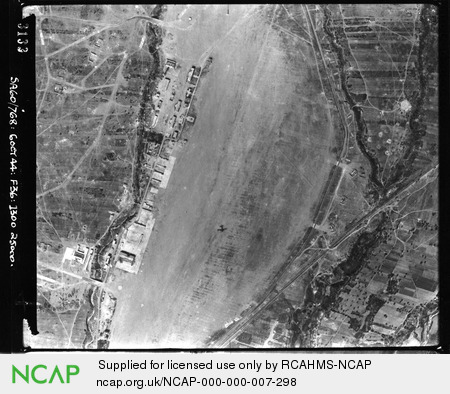 In both photographs, the hangars and workshops of the civil aerodrome are well out of shot, to the left and behind the camera position. From antiquity, the quarries of the Pentelikon yielded fine marble. The Parthenon was built from that stone: a presentation fragment lies in the foyer of our National Library here in Canberra, where I have spent many an hour teasing out the history of my father’s old Squadron. North to the top, the aerodrome photographed from 25,000ft in the early afternoon of 6 October 1944. The shadow of the photo recce aircraft (of 60 Squadron SAAF) is plainly shown, centre. German forces were already withdrawing from Greece: Athens itself was liberated on 14 October. The layout of the grass airfield much as it was known to the 211s in the Winter and Spring of 1940 and 1941. The extent of the permanent buildings, left, reflects the pre-war status of Tatoi as the civil airport of Athens, though the Germans may have added somewhat since 1941. The summer palace of the Greek Royal Family was at Tatoi proper, some 4 miles (8km) to the North by road, on the lower slopes of Mt Parnes. There HM George II King of the Hellenes was born in 1890. In World War II, the proximity of the Royal palace caused the RAF to adopt Menidi as the name of the airfield (yet often preferring “Menidi (Tatoi)”!). The village of Menidi with its railway station lay some 2 miles (4km) nearer Athens. 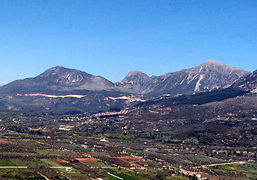 The 2004 Olympic Games Village was developed here in the Northern outskirts of Athens, between the Municipality of Acharnai (Menidi) and the Local Community of Thrakomakedones. A planning report on the Olympic connection observed that Menidi (Acharnai) was “a highly depressed area (in terms of environmental, social and economic conditions it has been experiencing) and contrary to that, the local community of Thrakomakedones is a wealthy suburban housing area.” To confuse the unwary, Menidi is also the name of a small resort town perched on the coast, deep in the Gulf of Amvrakikos in North Western Greece. Charles Lamb, in his engaging War in a Stringbag, reported that in 1941 Paramythia was not in Greece at all but in Albania. His mistake was later repeated by other writers. In fact the North Western boundary of Greece in 1941 was as it is today: at its nearest point, the border is over 20 miles (30km) NW of Paramythia. The modern boundaries of Greece had been set nearly thirty years before, by the 1913 Treaty of Bucharest. In settling the Second Balkan War of 1913, the Treaty included the ceding of Epirus (including Yannina and Paramythia) back to Greece. It may be that some confusion may have arisen for Lamb if his FAA charts were of pre World War I vintage, a not impossible case. Although impractical to reproduce all these in their entirety, part of the German Griechenland Nord sheet is shown on the Maps page. The blown culvert has been roughly repaired, left. 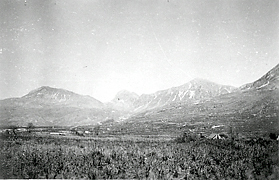 When the Italians invaded across the Albanian border on 28 October 1940, Paramythia was briefly occupied, suffering damage to the village. The Greek counter-attack was prompt and effective. By 15 November 1940, Greece was free of Italian forces (AIR 21/48 RAF Narrative—Middle East Campaigns Vol VI: The Campaign in Greece). 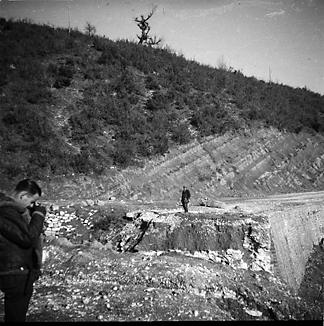 As the Italians rapidly withdrew deep into Albania, they also carried out some demolition of mountain road culverts, which were still being repaired as the 211 Squadron convoy journeyed North in February 1941. Despite the obvious dangers and the political tensions within Greece, the welcome accorded to RAF men in Athens, Corfu, Paramythia, Agrinion and elsewhere remains bright in the memory of veterans. When the Germans overran Greece in 1941, there were reprisals. On my Dad’s shot, he wrote Paramythia—From the camp looking North. 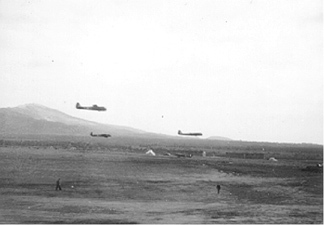 Paramythia village is sited on the lower slope of the ridge in the background, with the sugarloaf peak distantly behind.The war-time airfield occupies the foreground in his shot. Today the valley is filled with orchards and little clusters of dwellings up and down the river: in this cropped version of Kyp’s shot, the old airfield would lie to the right of centre in the foreground.